Here's a Nurgle marine I have had lying around for some time. I wanted to try out some techniques for rusted armour before I painted the chaos knights and this was the perfect subject. It's a metal model so easier to strip if things go wrong. But they seem to have gone quite right, so I will probably paint the knights in a similar way. It also encourages me to have a play with the plastic chaos marines, I have a fair number of them in the unpainted pile of plastics. I could knock out a couple of squads of these in the same time it takes to paint up one squad of orks, so it's a possible extra 40k army if ever I fancy a change of pace at painting. Definitely on the back burner at the moment as I have other things to do. EDIT Just noticed that's my 66th post, though I guess for it to be really spooky it would have to be the 77th! After buying the Mighty Empires set a couple of weeks ago, I was searching through my cupboard for two free tiles that had been attached to a White Dwarf issue - they were given away when the new set was re-released. I came across an old copy of the game, not complete but with enough bits to use with the current set. More than enough bits. I decided to try my luck on ebay, so on went some of the older Mighty Empires components, plus some Heroquest bits and pieces that had lain hidden for so long (probably about 15 years or more). A week later, they had sold for nearly £90! That leaves me with a cosy conundrum, a pleasant problem, a cordial quandary (yes, I am running out of alliterations). What do I spend the proceeds on? My first thought was yet more miniatures. I could easily pad out some chaos marines with a rhino, maybe terminators and a defiler, to get an instant "free" army. Then there's the upcoming Space Wolves, they look very tempting, and £90 would get me a codex, a battleforce and more. Again, potentially a good starter army for free! 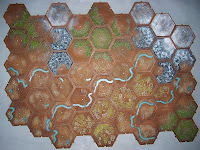 On the other hand, I could spend the money on something I have pondered for a while - a Realm of Battle gameboard. I have gamed for years on my dining room table, using an old piece of green cloth that I must have bought twenty years ago. Along with a couple of home-made hills and some trees, and a random assortment of buildings bought at gaming shows many years ago, these old stalwarts have seen me through a couple of decades of gaming. Practical and long-lived they are, but maybe it's time to move up to something much more in keeping with my paintstakingly painted armies. I received a copy of Mighty Empires on Saturday morning and immediately clipped off all the hexes and started building maps. After a couple of test maps I decided on this one, a regular rectangle fits into an old Battle Masters box, making it easier to store away. I decided not to paint each piece individually but to paint it while constructed. I didn't bother to clean up the hex edges, they fit together very tightly but that helps to maintain the map rigidity. A few mould lines around the edges are not important to me. I sprayed both sides with GW white primer. Then I sprayed the upper side with a brown, using my airbrush. I then did some basic drybrushing to bring out the textures of the tiles. Wilderness areas are mostly brown, the forest areas are painted green and there's a bit of clump foliage on them too. The mounains and tundra are grey, topped with white, and a little snow flock. The cultivated areas I painted the fields in dull yellows (wheat fields) and added some green flock. I spent about 4 hours in total, over three sessions and am really pleased with the end result. Not so pleased with the markers that come with the set. The city, fortress and mine markers are very small and indistinct. Luckily, I still have some of the plastic bits from the original game and these are far bigger and better. Instead of flags I think we might use shields to mark territory. While they would not slot into the board, a blob of blu-tac will do the job. I might even suggest that players might want to make their own city markers, at least for their capital. Or maybe each player could mark their capital territory with an army banner.